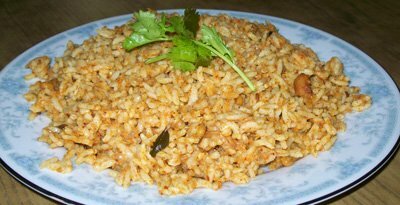 Mango Rice is a special rice recipe from the Southern State of Karnataka. It is a main item of the menu on 'Ugadi", the new year day feast, which falls in march or April every year. 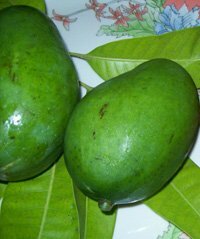 It is called 'Mavinkai Chitranna' - 'raw green mango rice' in Kannada language. This Mavinkai Chitranna is made specially in the beginning of the summer when the raw green sour mangoes are available in plenty. Along with Kairi pana or Mavinkai panka, mavinkai chitranna is on the menu to celebrate the new year. Choose green sour mangoes for this recipe. If you are planning to keep it for long, do not use fresh coconut. Use desiccated coconut instead. or omit coconut completely. This rice tastes good when the sourness of mango, salt, sweetness of jaggery, the hotness of red chilies and the light bitterness of mustard seeds is balanced properly according to your taste. This can be made in advance as it doesn't need to be served hot. It is served at room temperature. Take it for picnic or for lunch to work. Send it as a gift to your neighbor. Grate raw mango and fresh coconut. Check the sourness of the grated mango and if it is too sour, reduce the quantity of grated mango you will use for the recipe. Grind together grated mango, coconut, red chilies, mustard seeds, cumin seeds to a fine paste. Add a little water if necessary but not too much. Heat oil in a pan. When it is hot, add mustard seeds, cumin seeds. Let them splutter. Add the dry red chilies now (if adding). Add peanuts and fry for a 15-20 seconds or till you get the peanut flavor. Do not let the peanuts overcook. Add the mango paste. Add curry leaves. Add jaggery and salt. Stir once in a while. Cook till oil separates and the paste thickens. Remove from fire and cool a little. Add cooked rice. Mix the rice well with the cooked mango mixture. You may need to use your fingers to mix well. Add a little salt if necessary. Serve any time ; lunch, dinner, party, picnic. You may also pack it in the lunch box. You can serve it at room temperature.So it is convenient to serve at party and picnics. Also good for a lunch box. If planning to serve after 4-5 hours, use desiccated coconut instead of fresh coconut. The sourness of a raw green mango depends on it's variety. If it is too sour, you may need to reduce the mango quantity. If you already have roasted peanuts, you may add the them while mixing rice instead of frying them.